Want to stop wasting energy with your water heaters and spend less money on your water heating bills? Then consider buying and installing a drain water heat recovery device. Buying and installing the system is especially important knowing that around 18% of energy consumption in residential homes comes from water heating, the second most energy-expensive luxury behind the space heating. Water heaters today are faster, more efficient, and a lot easier to use than before, but still the energy consumption is high, which can not only damage your pocket but the environment by emitting NOx and CO2 gases. This is a big problem nowadays, but luckily there is still a remedy for it. A drain water heat recovery system, for example, allows users to minimize the total energy consumption from water heating by 25% or even more. And they are pretty straightforward, with no electrical functions, no controllers, no pumps, no moving part, and need little to no maintenance while providing a long-lasting service of more than 20 years. Drain water heat recovery (DWHR) systems will also bring down your monthly water payment by 5% to 20%, which comes handy for many people. However, buying one of these systems is not necessarily an excellent choice for everyone. Do you need a Drain Water Heat Recovery System? DWHR systems are typically used in homes where water heating increases bills exponentially, and household with the family of four, or more members. They are designed to be used with showers, not sinks or toilets. So, if a household uses more sinks, toilets, and other applications but not showers, and if the home has not more than two persons – then a water heat recovery system won’t be as effective, efficient and it will take many years before it pays off. These systems, however, are not only used as a way to save money but as a way to preserve water and energy. Installing a DWHR is more about getting a home to provide a more sustainable approach and helps to protect the environment. The payback, regarding money savings is not much for some, but enough if you are also considering its sustainable efficiency. So, do you need one of these? It comes to how much energy you want to save and how much you want to help the environment. How Does a DWHR Work? A single waste water heat recovery system helps to utilize the energy from the wastewater from showers (mainly), sinks and washing machines while increasing the temperature of the incoming cold water. In the shower or a sink, warm water from the cold side mixes with the hot water from the water heater – resulting in using less of hot water. There is also an option to connect the unit to the water heater, so the preheated water from the DWHR system can feed the water heater so less energy is used for tank water heating. 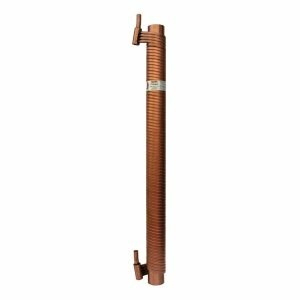 A DWHR is made of a thick copper pipe that goes around a copper drainpipe in a helical profile, which is where the drain water waste goes through. Here is where the heat transfer process begins, when the drain water heats up the drainpipe and then this heat is transferred to the outside copper pipe where the fresh water is flowing through. This process reduces energy consumption exponentially (some experts say over 40%), by providing a drain-heating process no other device can provide, reducing the energy from gas and electric water heaters. A drain water heat recovery unit increases its heat potential - the more drain water there is, in a straightforward and simple process that demands less energy than any other. It works even better when the incoming fresh water is already warm. Some of these devices may even store the water in a tank, heating it up while it is standby by flowing warm drain water in the bottom. These waste water heat recovery systems provide a boost both in the heating capacity as well as in pressure, making it easier for users to receive better results faster. Just like any other product, using a DWHR comes with both pros and cons. These will tell you whether using waste water heat recovery systems is a good choice for you. They can be installed into the old drain systems or installed with a new drain pipes project. It is better to install it in the new homes as the retrofitted in an existing system can cost more money. They can go from 36 to 120 inches in length and from 3 to 4 inches in diameter – making them versatile enough to fit different pipe systems. DWHR system requires little to no maintenance. Installation is straightforward and doesn’t demand much experience or special tools for a DWHR to be correctly installed. They mainly work with water from showers and sinks. When all showers from a household do not drain into one drainpipe, the effectiveness of the device lowers exponentially. Low efficiency in homes with less than three occupants due to a very likely meager use of showers and sinks. The payback is not seen soon enough. A DWHR takes more than five years to show any payback. Maybe less depending on how much use the system receives. They can be costly as well, rounding $500 for an efficient but straightforward device. The most expensive and useful ones can go up to $1000 or even more, without the installation. Drain water heat recovery units are merely outstanding if you’re looking to save energy and make your home more sustainable. Both the energy and money savings will receive a boost each year, not a giant increase but good enough to make it worth the installation. According to the cmhc-schl.gs.ca and the study that was done for Canada in 2012, the estimated cost savings are from $74 to $171 between Montreal, and Whitehorse, also including Toronto, Calgary and Vancouver. The given chart was comparing heating with the electric water heater only and combined with the drain water heat recovery system. Estimated annual energy cost savings are much lower when the comparison was done using the gas units, and it is in the range from $41 (Calgary) to $81 (Montreal). By reducing the energy consumption, a DWHR unit will make water heaters work less than they would without a waste water drain heat system. This adds a few years to the lifespan of a water heater. All DWHR units are compatible with a wide array of pipe drain systems. Most of them can be used in practically any home without problems. They can be attached to other water heating systems as well to improve efficiency even more. Requiring no maintenance, being highly efficient, and providing a long-lasting working life, a waste water heat recovery system provides one of the most reliable experiences when it comes to being sustainable. You won’t have to worry about anything for 20 years after installing one of these. This technology is already proven and in use in many homes. Yes, the water waster recovery system comes with a higher initial cost, but once installed the homeowners will appreciate zero maintenance, lower energy usage and money savings, reduction in the carbon footprint and an increased comfort. Don’t waste more water without the purpose – combine your high efficient, condensing water heater with the DWHR system and get excellent results! Lower the temperature on the thermostat. Install the insulation blanket (especially if the tank-heater is older). Install the pipe insulation (foam sleeve). If the water heater does not have factory installed heat traps, install them. Make sure to maintain the unit regularly and as suggested by the manufacturer (cleaning, draining and flushing). Check for leaks and do the necessary repairs.